There are approximately 500 homes in Lockwood Glen and the Echelon at Lockwood Glen. It's hard to know how large this neighborhood will be as land continues to be developed. The first homes were occupied in the Spring 2014 and were built by Celebration, Goodall and Regent Homes. 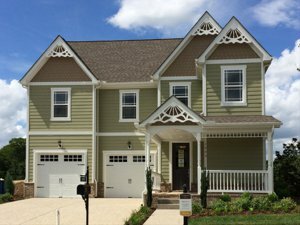 The newest homes in Echelon of Lockwood Glen are being built by Celebration, Ford and Mallard Homes. Many of the builders list this neighborhood under Lockwood Glen, not Echelon of Lockwood Glen in our multiple listing service so it's easy to miss new homes as they come on the market. We've included both areas below so you can easily find the homes you desire. Amenities include a neighborhood swimming pool with beautiful outdoor area, clubhouse, playground and basketball court. Lockwood Glen residents have a short drive to the Cool Springs and Berry Farms retail districts. While the bulk of shopping and dining are located in Cool Springs, Berry Farms is quickly becoming a destination location. It's still in the early stages of development but residents are liking the proximity and addition of new restaurants and shops. Residents like having a Publix Grocery store so close to home. For those who frequent historic, downtown Franklin, it's a 15 minute drive via S. Carothers or Lewisburg Pike. Lockwood Glen homes for sale in Franklin TN is served by Williamson County Schools. Students attend Trinity Elementary, Page Middle School and Page High School. School zones are constantly changing due to our continue growth. Parents should always verify school zoning prior to writing an offer. Selling your Lockwood Glen and Echelon at Lockwood Glen home has become a greater challenge. Your primary competition comes from builders, not your neighbors. The one thing you have to offer that many builders do not is a quick occupancy. Many buyers don't have the luxury of waiting months until a home is built, especially if they are relocating from another area. Our brokerage has a large internet presence attracting 15,000 visitors a month to our website. We know how to get your home in front of the right buyers. Ever try to search for your neighborhood on Zillow? Guess what? You'll find new construction there, but not existing homes. We have made it easy for buyers to find your home. Just Google Lockwood Glen or Echelon of Lockwood Glen, you'll find us ranked on page one of Google. I'll tell you it's no small feat to do that. Internet competition is fierce. As a small, boutique brokerage, it's amazing that we've been able to beat out larger, national real estate firms who have a lot more money to invest in marketing. And yet, we appear on page one of Google and they do not. As experienced Franklin real estate agents, we are here to help you find the right Lockwood Glen home. Our vast knowledge of Franklin can help guide you through the process. Buyers should remember to hire a Buyer's Agent, even when purchasing new construction homes. A Buyer's Agent will represent your interests during the transaction and can save you tens of thousands of dollars. The best part--the listing broker or builder pays your Buyer's Agent's fee. More than 30% of our business has been assisting buyers with their new construction home purchase. Lockwood Glen sellers will benefit from our vast knowledge of internet marketing through our website, blogging and social media. Just pick up the phone to learn how we can get your home in front of the right buyers. It is always our pleasure to assist both buyers and sellers with all their real estate needs.